4. Once the Feed is retrieved, adjust the Gadget Settings and Save the Gadget. One remark: you do not need to change the domain. It works with the original blogspot domain too. Thanks for this information and Tipp !! I have already done this. But, I think it has drawback. It only shows maximum 5 posts. So, I use the recent post widget with thumbnails and feed from feedburner to show 10 posts. Thanks. I have tried it out. But sometimes it doesn't work, it just leave a "reload" thing. So I took it out. I already added this any other ways ?? Thanks a ton for this!! You've been providing us great Plugins!! Thanks..
recent post will show 10 post ? @Danialde4 - nope, the feed gadget won't allow you to show more than 5 posts. 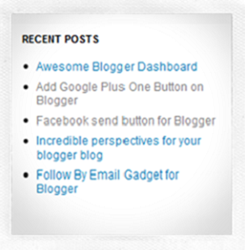 1.You can add a second Feed Gadget which will show the next 5 posts. It beneficial for me, Thank you very much. How do you do this for a private blog? This is good but i need something with dynamic thumbnail depending on the post. a more elegant design. Thank You Very Much for this! Very Helpful!